These collages are available for purchase, priced between $200 and $400. Cards are available in sets of 4 (identical) for $12. Scroll down to see these collages as larger images. ". . .and when he shall die, take him and cut him out in little stars and he will make the face of heaven so fine that all the world will be in love with night." This 20"x16" collage uses cut and torn paper and pen and ink. The brief, bright hour of fellowship with thee." This cut paper collage measures 16"x20", including the burgundy mat. 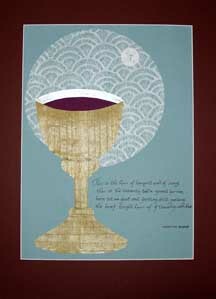 It uses various papers to depict the bread and wine of the communion meal. 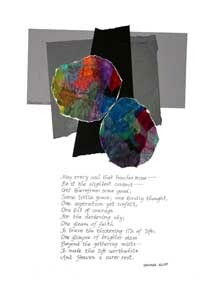 The two following collages use other stanzas of Bonner's poem. Thou still art here with us -- our Shield and Sun." This is the second stanza of Bonner's poem. 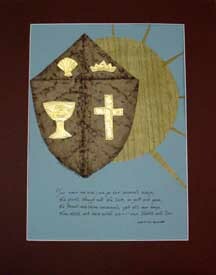 The sun is cut from the same paper used in verse one for the chalice. The symbols on the shield are made from metal foil with embossed textures. The collage is 16"x20", including the burgundy mat. The Lamb's great marriage feast of bliss and love." This is the concluding verse of Bonner's poem. The circle behind the Lamb uses the same paper as the chalice and sun in the two collages above. 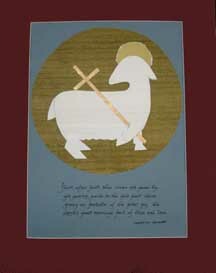 The Lamb is formed with layers of white paper to suggest a wooly coat. This collage is 16"x20" including the burgundy mat. "Eternal light, shine in my heart; eternal hope, lift up my eyes; eternal power, be my support; eternal wisdom, make me wise. Until by your most costly grace, invited by your holy word, at last I come before your face to know you, my eternal God." This detail shows most of the different kinds of papers used in this 16"x20" collage, including a page from the Bible, vellum, various handmade and commercial papers. Love is come again like wheat that springeth green." 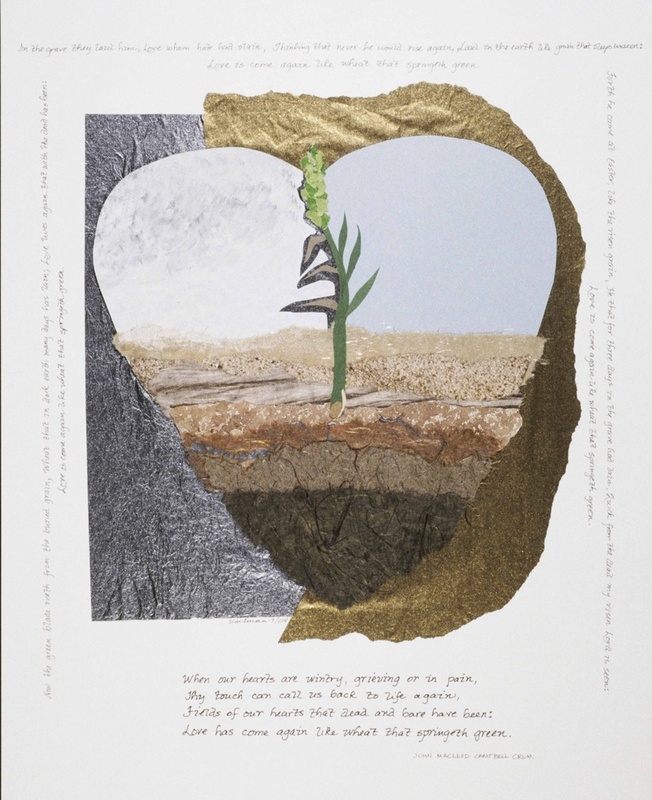 The first three verses are hand-lettered around the left, top, and right sides of the 16"x20" torn and cut paper collage; the fourth verse is below the grain of wheat springing from the ground. Available only as a print. The amount of text makes it unreadable in card size. And Heaven a surer rest." This 16" x20" collage combines cut and torn paper. The detail, left, shows the tiny gold that appears at the point of contact of the two circular forms, the touch of one soul and another. My Christ, my Christ. . . ."
The papers painted and prepared for this collage are somewhat luminous. 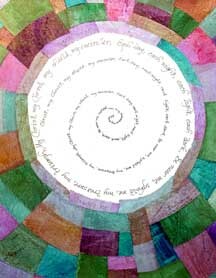 The prayer is printed once on the inside the circle and then repeated in a spiral near the center of this 16"x20" collage. "I asked for strength that I might achieve. I was made weak that I might learn humbly to obey. I got nothing that I asked for, but everything that I had hoped for. Almost despite myself my unspoken prayers were answered; I am, among all people, most richly blessed." This 16"x20" collage uses acrylic paint and ink on paper. The text is an integral part of the design. 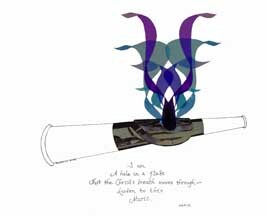 "I am a hole in a flute that the Christ's breath moves through. Listen to the music." The collage measures 20"x16". It uses transparencies, metallic papers, teflon fabric, and ink. 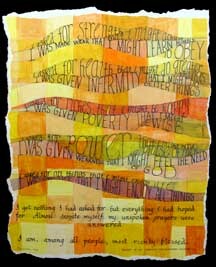 The idea for this collage came from my friend Diana (the one who sent me the Henri Nouwen book that began all these collages!). She preached a sermon in which she illuminated how through Jesus' death, the symbolism of the cross had been completely changed from shame to reverence.